Christmas is icumen in, lhude sing St. Nick! I almost feel like we are a big-box store, focusing on our Christmas concert now when there is so much that happens before that: the Texas Toot workshop this weekend, then Thanksgiving, then the St. Cecilia Baroque Festival, and then our four days of rehearsals, and then our concerts. I can’t wait! And then…well, there’s much more. At any rate, we aren’t having Black Friday Sales, so I’m relieved to remember that we aren’t a big-box store! More soon! Last chance to get discounted Partial Season Subscriptions for the remaining 4 concerts of the season! Partial Subscriptions for 4 concerts are $108 general, or $90 for seniors. Click on the "Buy Partial Season Tickets" button below. at the concert door for $5. It’s already time for another Early Christmas! Join us as we explore the mystery and intangible essence of Christmas as TEMP puts its unique stamp on joyful carols and traditional songs from Western Europe and the British Isles, where many of the musical traditions we hold dear at Christmastime originated. TEMP will perform joyful and beautiful selections from these countries and others with innovative arrangements for solo voices, small chorus, harp, violin, flute, mandolin, viols, and lute. The familiar theme of the Nativity from the shepherds’ perspective—their wondrous and terrifying experience with the angelic host and their subsequent gathering around the manger to adore the Christ-Child—figures prominently in most early music Christmas repertoire, as do the themes of the Mother and Child and the New Year. We will present two iconic 12th–century works from France illustrating this theme: “Orientis partibus” and excerpts from the Play of Herod. Lively works from an anonymous Spanish composer (“Falalanlera”) and an exciting double-choir work by Giovanni Bassano illustrates the importance and the beauty of Advent and Christmas in Renaissance Spain and Italy. Not to be outdone, however, are the works of composers in the Lowlands, whose diverse, virtuosic compositions for Christmas celebrations remain unparalleled in sheer beauty. The little-known Flemish composer, Guilielmus Messaus, created mini-masterpieces in this genre, and TEMP is happy to bring these to light for our audience. We are also glad to announce the return of our favorite Dutch carol: We haven’t performed “Herders hy is geboren” in several years, and its return is long overdue. Our Christmas concerts are never complete without a little Celtic and English influence! Our versions of the “Christ-Child Lullaby” and “Drive the cold winter away” are in the program this year, as well as other favorites from the Celtic traditions. We are proud to feature nationally-acclaimed historical harpist Therese Honey, who will play the popular 18th–century Welsh “Nos galan,” which is very similar to one of the present day’s most ubiquitous Christmas carols. Which one? Come find out! Our featured soloists include Jenifer Thyssen, Stephanie Prewitt, Meredith Ruduski, Jenny Houghton, Cayla Cardiff, Jeffrey Jones-Ragona, David Lopez, Brian Pettey, Thann Scoggin, and Daniel Johnson. Our instrumental soloists include Bruce Colson (violin), John Walters and Jane Leggiero (viols), Marcus McGuff (flute), Susan Richter (recorders), and Scott Horton (lutes). 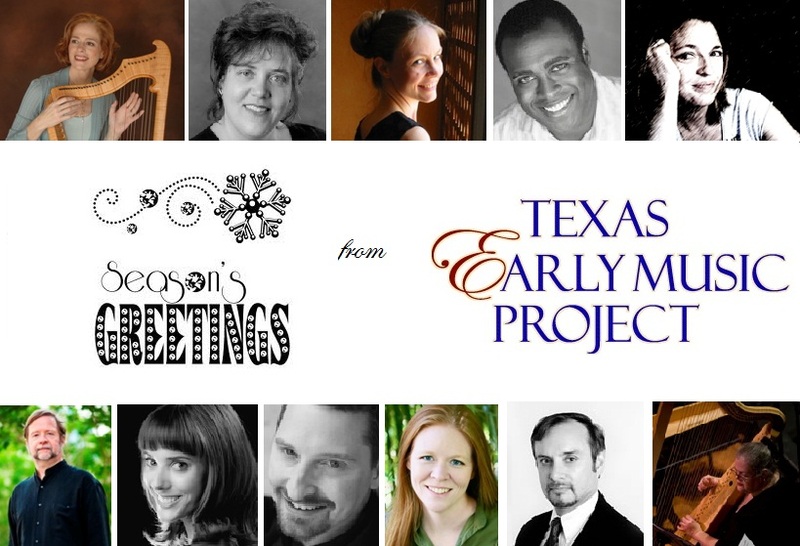 Join Texas Early Music Project for a splendid evening of music. Encompassing eight hundred years of festive creativity and beauty, this music is sure to delight your ears and warm your heart. In celebration of the Christmas spirit, and in hopes of entertaining you, I posed a few questions to our performers. What we learned from this endeavor is that TEMP has more than its fair share of amateur comedians and smarty-pantses. Without further ado, I’ll let the performers speak for themselves. Look for additional upcoming Q& A posts & happy holidays! 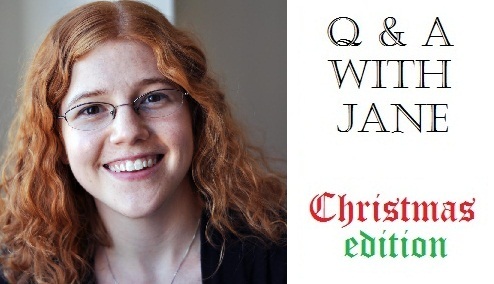 Claire Daniels: It is hard to pick favorites but I don’t ever tire of Handel’s Messiah. Sorry to be cliché! This is my first Christmas with TEMP though, and I really love the music Danny has picked for us to sing. John Walters: I like lots. I like the old classics. I like new original music if it's good--my definition of what's good of course! I loved finding new arrangements of Christmas for my school orchestras to play. Cayla Cardiff: French carols, medieval English carols, Ariel Ramirez's "Navidad Nuestra", and Britten's "Ceremony of Carols." Meredith Ruduski: 1940s and '50s crooner/jazzy stuff. Scott Horton: Early 17th century like Gabrieli, Biber, etc. Becky Baxter: The Chieftains recording entitled "The Bells Of Dublin" and that old Hershey's Chocolate kisses TV commercial where the animated kisses are pretending to be handbells ringing "We Wish You A Merry Christmas." I still get a kick out of the last little kiss saying "Whew!" because it reminds me of how I will feel at the end of December after all the gigs are over! What is the worst holiday pop song? John: I don't know. I'm too fast at tuning it out if I think it's going to be bad. Claire: I don’t really mind the Christmas pop music. However, I HATE any version of We Wish You a Merry Christmas and the 12 Days of Christmas. I don’t think I’ve ever heard any version that I liked, so why bother? Jeffrey Jones-Ragona: Without a doubt, "Christmas Shoes." The first time I heard that song, I no longer believed in puppies, the laughter of children, or anything good. How many concerts do you have during the month of December? Does your spouse/significant other/cat remember what you look like by January 1? Abby Green: Mid-December is finally when I have some time off. My tour/travel/festival season is July thru December. I hardly stop at all. December is my light at the end of the tunnel. I finally get to breathe and relax! Cayla: Including school work: 10, not counting the three I'm supposed to be at but am sending a sub, and not counting church. Jeffrey: Typically, one (different) one each weekend, and some weekends, I have had as many as three different concerts-- not the same concert given three times, but three *different* repertoires/events/ensembles. Although one year it was all Messiah-- just three different orchestras, conductors and Choruses. Of course, the weeks before are occupied with rehearsals. It's not unusual for December 26th to be my first full day off since Halloween or earlier. And no, I have to get reacquainted with my cats right after Christmas. They are definitely inquisitive and mildly distrustful when I spend an entire day at my house. Although I spend most of that day like they do--sleeping! Meredith: Regarding pets and loved ones: after they get through the initial barking and smell my hand, they remember that I feed them and do the "recognition wag," though my husband still acts a little weird if I make sudden moves or go around his food bowl. You get invited to a white elephant gift exchange. What do you bring? Claire: A white elephant, you say?! Danny: Another white elephant? Wait, they didn’t say this was gonna be on the test. Abby: A sleeve of saltine crackers wrapped in really pretty paper. What’s the weirdest gift anyone ever gave you? Abby: I can't think of any that stick out in my mind. I have given many odd gifts... my favorite this year is a fuzzy pink monster puppet. The recipient is 30 and she is going to LOVE it. Meredith: A box of tampons. What do you like to do in Austin at this time of year? Cayla: Shop for local stuff on South Congress! Claire: Sing Christmas music! Especially descants! Danny: Apparently, I like to give concerts! Oh, and I do like the weather, usually, except when it’s 80 or so…. Meredith: Take allergy medicine and go on hikes! From pipers piping to partridges in pear trees, which of the 12 days of Christmas is your favorite and why? Abby: FIVE GOLD RINGS!!!! Because of Miss Piggy's contribution in the Muppets' Christmas album. Scott: The 13th day upon which I rest. Meredith: I think "seven swans a swimming," although I wouldn't want to clean up after them. Becky: Five gold rings - I'm a jewelry hound. Cayla: Three French hens. I don't know why. They sound happy. On a scale of 1 to 10, how much would you freak out if it snowed right now? Abby: If by "freak out" you mean throw a temper tantrum because I'm supposed to camp next week...I'd say a level 7 freak out, and a sad face. Becky: I'm a Texas native. Nothing in Texas weather surprises me or freaks me out. Now, finding a snake or a scorpion inside the house is a whole other story. Cayla: 2. I'm not easily impressed. Scott: -1, i.e. not at al! Snow, snow, snow!!!!!!!! Danny: In general, I'd give it a 4.5. John: I love the snow. I'll be out making snowmen and having snowball fights. Specifically for out-of-towners: What do you like about coming to work with TEMP? Becky: TEMP has quite a few 'closet' stand up comedians. [This questionnaire proves that pretty well! – ed.] A great sense of humor in rehearsals is a blessing when you have a lot of music material to cover in a short amount of time. Specifically what I love about coming to work with TEMP for the December concerts is that I get my annual "fix" hearing Stephanie Prewett sing "Balooloo, my lammie." There is something exquisitely comforting about the way she sings it. At different times all through the year when I am having a tough day, the memory of her singing "Balooloo" will replay in my mind like being wrapped up in a warm blanket. Abby: TEMP is awesome...no, really. I get the chance to sing some amazing music with some of the most gorgeous voices I have ever heard. Not only is the musicianship outstanding, but everyone is so NICE! It is such an absolute honor to get to absorb some of this music and friendship even if only for a week per year. What is your favorite thing to do when you visit Austin? Becky: Wheatsville Co-op, Instep (best shoe store in Texas, if not the world), and Blue Moon glassworks, Austin Flameworks, and Austin Art Glass to see the cool art glass and meet the wonderful artists. Abby: Eat cheese enchiladas, hang out with friends, drink a margarita or three.